Edited by: Brian Seager, et al. By providing guidance that will help your students practice and troubleshoot their exam technique, this book will send them into their exam with the confidence to aim for the best grades. 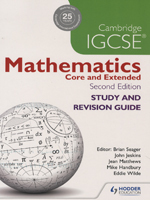 - Common misconceptions and errors are highlighted throughout, so they can avoid making the same mistakes - They will become comfortable with constructing and writing answers through a range of practice questions - Answers at the back of the book allow them to compare their effort, and easily identify any improvements they can make - Key objectives at the beginning of every chapter help them target their revision, allowing them to focus on the key concepts and skills - Examiner's tips throughout provide suggestions on how to approach the questions, so they don't waste valuable time in the exam This title has not been through the Cambridge International Examinations endorsement process.